The ultimate trio of fashion capitals "London - Paris - New York" : this is where it all happens! From fashion weeks to fashion exhibitions, there is always something to see and do. If fashion is your passion, get some pointers from Petite AMIE on the latest and most interesting happenings. This fall, London is offering lots of interesting fashion related events to its residents and guests. In addition to the Fashion Week and Frieze Art Fair, both major events that took place in September and October 2017, there is still much to see that will be on for several more months in the Big Smoke. 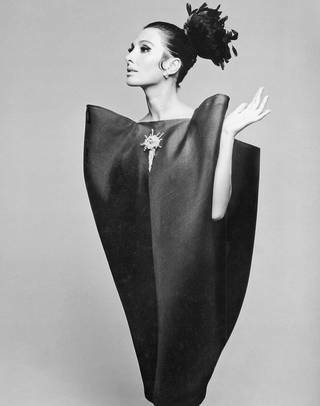 This exhibition explores the work and legacy of the Spanish couturier, showcasing over 100 garments and hats crafted by Balenciaga, his protégés and contemporary designers working in the same innovative way today. It examines Balenciaga's work from the 1950s and 1960s – arguably the most creative period of his career – when he dressed some of the most renowned women of the age and became revered by his contemporaries, including Christian Dior and Coco Chanel.The exhibition features examples of Balenciaga's revolutionary shapes from this period – the tunic, sack, baby doll and shift dresses – all of which remain style staples today. The exhibition is open daily from 10am till 5:30pm with the exception of Fridays 10am-9:30pm. The tickets are £12/$16 (concessions apply). It runs till 18 February 2018 so you still have time to get a peek! This exhibition explores how California came to have such a powerful influence on contemporary design. "Designed in California” is the new “Made in Italy”. While California’s mid-century modernism is well documented, this is the first exhibition to examine its current global reach. Picking up the story in the 1960s, the exhibition charts the journey from the counterculture to Silicon Valley’s tech culture. You can book a visit Monday-Sunday from 10am till 5pm. Tickets are £16/$21 (concessions apply). The exhibition runs another week till 17 October 2017, hurry up! This exhibition is one of a kind retrospective of Louise Dahl-Wolfe (1895–1989) work as one of the most important women fashion photographers of the first part of the 20th century. The key focus of the exhibition is Dahl-Wolfe’s 22 years as leading contributor to Harper’s Bazaar. Considered a pioneer of modern fashion photography, the exhibition highlights how Dahl-Wolfe defined the image of the modern independent post-war woman.